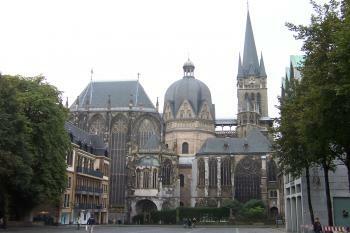 The Aachen Cathedral with its Palatine Chapel is the oldest in Northern Europe and has high symbolic value. It dates from about 800 AD. The Emperor Charlemagne himself had overseen the construction work, until it finally complied with his wishes. What they actually had built was a palace for him, of which now only the church remains. During the 14th and 15th centuries new features as the choir were added to the church, in the then fashionable Gothic style. More additions followed in the following centuries, the 74 meters high tower as recent as 1884. Obviously this permanent (re)construction of the Cathedral lead to a mixture of styles. Charlemagne died in 814, and was buried in his own Cathedral. His bones are still preserved in the Shrine of Charles. The Cathedral (or Dom) isn't the landmark you would have expected. 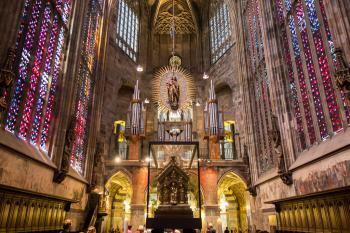 Compared to its counterpart in Cologne the one in Aachen is no more than a "regular" church. The building is also in very bad repair, large reconstruction works are on the way. There was a marriage going on in the Cathedral when I was there, so entrance for regular visitors was closed for a few hours. I spent those in the "Schatzkammer" (Treasury), a nearby museum that houses valuable treasures belonging or connected to the Cathedral and its founder Charlemagne. The extreme wealth that is displayed there I found a bit unnerving: Charlemagne thought he was God (or at least closely connected to His Son), and his followers through the ages agreed with him. In the museum you can for example see a golden arm and hand, with 2 real bones in it of Charlemagne. In the afternoon I finally could enter the Dom itself. Focus point of attention is the octagonal chapel, with the large 12th century chandelier. The inside looked much better than the outside I must say, so it was half-a-day well-spent. 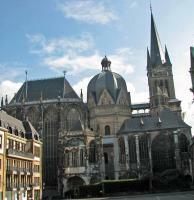 One of the first sites inscribed on the world heritage list is Aachen Cathedral. It was part of the first batch of sites in 1978 and is also the first German site to be inscribed. While some German additions in the 80s are dubious (looking at you Hildesheim), there can be little doubt that Aachen belongs on the list. Standing in the octogonal chapel you can clearly trace the architecture back to San Vitale in Ravenna. There is a reason they call the period Carolingian Renaissance. They were trying to reclaim some of the glory of Rome and Late Antiquity and it shows. And albeit the Cathedral pales in comparison to the Pantheon, the Hagia Sophia or the afore mentioned San Vitale, it is clearly a major step up from the Longobards in Italy. Now I have to admit that I am a bit biased on this one. Aachen is my alma mater, having studied at the glorious RWTH. I have visited the site frequently while I was a local. Every guest of mine had the privilege to see what the Öcher (local term for person from Aachen) got in their trade with the devil (more below): a unique church and the single most outstanding example of Carolingian architecture world wide, a truly world class site. Since Charlemagne's times the cathedral has undergone significant changes. The original palace complex of Charlemagne to which the church belonged is gone. The church has grown substantially as several chapels were added all around the central octogan, one even being larger than the main octagon. In the Baroque period they also remodelled the church interior in Baroque style with plenty of marble. Fortunately, this was undone in the 20th century. If you visit the museum, you can see pictures prior to the remodelling. Several legends are tied ot the Aachen Cathedral, the most famous being the deal of the citizens of Aachen with the devil. The citizens promissed the devil the soul of the first visitor to the church for his help in finishing the construction. But when he came back to the finished church to collect his prize he got shortshifted. He found a wolf where he had expected a human. In his anger he slammed the church door, but one of fingers got stuck and tore. To this day the main church door holds his finger. The story even continues. In his anger the devil planned to burry the church below a mountain of sand. He carried a huge sack of sand on his back nearly all the way to Aachen. But just short of the city line he took a break and asked a local woman how much further it would be to Aachen. Realizing whom she was talking to, she lied and pointed at her shoes. "You see in what poor state they are in? That's how far I have walked from Aachen to get here." Tired and desparate the devil dropped the sack and went home. The spot where he dropped his back is now the local hill, the Lousberg. The upper levels hold Charlemagne's throne built from plaster stones sought to originate from Jerusalem. For centuries German emperors would come to Aachen for their coronation. Aachen is well connected by regional train to the two centers of North Rhine Westphalia: Düsseldorf and Köln. There is also a local bus connecting Aachen to nearby Maastricht as well as regional trains to Heerlen in the Netherlands and Liege in Belgium. Due to its location on the main fast rail axis from Cologne to Paris via Brussels you have plenty of options continuing your travels, even to London. If you arrive in Christmas season (recommended), have a Glühwein at the steps of the Dom on the Katschhof. The whole city is covered by Christmas markets, but the Katschhof between Town Hall and Dom is the place to be. Taste Printen. I would opt for the chocolate ones. True Printen are a bit hard to take. Take a stroll along the pubs and restaurants of the Pontstraße up to the Ponttor. The medieval parts of Aachen are scattered across the city and while not WHS material still worthwhile exploring. Get a free drink at the Elisenbrunnen. Hard to miss, just follow the smell. Go to the Lindt Factory Outlet store. Climb the Lousberg to get a view of the city thanks to the devil's intervention. If you want to see the Centre Pompidou done wrong, the University Hospital of Aachen will not fail to deliver. Feel free to wander around the endless green hallways. Emperor Charlemagne saw himself as the successor of Roman ancestors. He built a new empire and wanted his chapel to reflect that. Therefore, the octagonal shape of the Palatine core wasn’t about aesthetics but because of religious motives. The octagon has eight sides. For christians the eight stands for rebirth, a new beginning. The resurraction of Jesus was on the first day of a new week, aka the eigth day. But not only his resurraction was a new start, so was his birth. His mother Mary is therefore connected to the number eight as well. It’s no coincidence the cathedral was named after her. Since the ancients the octagon is seen as a form between the square (earth) and the circle (heaven) The octagon stood in between these basic forms just like the emperor stood between God and its people. There’s more. In the book Revelations the prophet speaks about a heavenly Jerusalem built from the number twelve, the number of perfection and angels. The measuring of the number twelve can be found everywhere in the cathedral, for example the octagon measures 144 feet, 12 x12. I like these kind of details. I was always teached that people from the ancients weren’t that bright but they certainly knew about their classics. About building with a meaning, about perfection in size etc. Fascinating stuff but I already said that. This is a really special WHS - for so many reasons. I love that it is tiny but still has so much to see inside. There are different parts to the cathedral and so much detail in each of them. I love that it is easily accessible from a few different countries, meaning that you will naturally path through Aachen and be able to see it if you are travelling between countries in this part of Europe. I love the history and the reason for it being constructed, plus its use for the many centuries afterwards. And I love that this was the first site named in Germany. It's so fitting because you can learn so much about German history from this one small building - so much can be traced back to here somehow. This is one of those must visit sites and so it's luck that it's so easy to do so. It is considered the oldest cathedral in northern Europe. It dates back to the Palatine Chapel built by Emperor Charlemagne in the late eighth century. From this original core, the church grew and grew over the centuries to form the current set, which is a conglomerate of many different architectural styles. I love the Aachener Dom.The marble has such a warm feeling to it.mass on new years day is also a wonderful experience and chito it was a wolf that bit of the devils thumb not a goat. The Aachen Cathedral was among the first twelve entries in the WH list in 1978 and was the first German WHS. This is justified because of the historical and architectural significance. Charlemagne wanted to create a Christian empire north of the Alps in succession of the Roman Empire. He built his palace in Aachen, at the place where today the City Hall is. 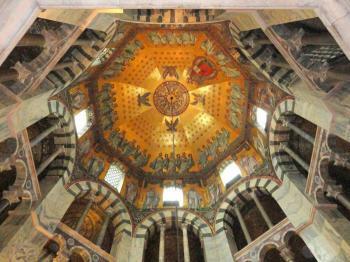 His Palatine Chapel, the famous octagon, is the core of the Aachen Cathedral. It is considered the oldest (and for a long time the largest) vaulted building north of the Alps. But the Carolingian structure is not visible from the outside, it is covered by a striking Baroque dome (that reminds of a lemon squeezer) and surrounded by a ring of Gothic chapels. The Gothic choir hall, the Baroque dome and the tower of the westwork dominate the unusual outer appearance of the cathedral. However, I liked that mixture of architectural styles, certainly there is no cathedral with a similar shape. The interior of the octagon is stunning: the massive columns, the high arches of the upper gallery, the huge copper chandelier. And also the mosaics of the dome and in the aisle harmonize with the whole ensemble, though they are relatively new. They were made in the late 19th Century based on medieval motifs. But also parts of the Carolingian artwork have been preserved: the ancient marble columns in the arches of the upper gallery (some of them are in the Louvre), the bronze gratings, and the bronze entrance doors which are decorated with lion heads. Admission to the cathedral is free (only one Euro donation for taking pictures), but I recommend to take a guided tour. You can walk in the choir hall and have a closer look at the Shrine of Charlemagne. I was impressed by the architecture of the choir hall, it consists almost entirely of glass windows. 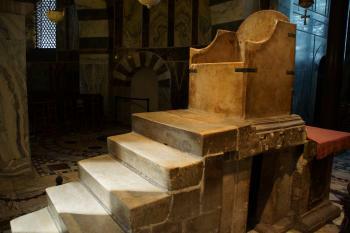 And you can visit the gallery with the throne of Charlemagne. The throne is simple and plain, decorations are entirely absent (photo). It is made of marble slabs which came from Jerusalem and have been dated to the year 800. Charlemagne, however, was not crowned on the throne, but after him Aachen was the coronation place of German monarchs for about 600 years. The Aachen Cathedral and the nearby Cologne cathedral are the most important religious buildings in Germany, but they are different in almost every respect: the size, the historical significance, the architectural style, and the appearance of the surrounding square. Aachen is a charming city, the university (with some interesting modern architecture) is close to the old town and ensures a good night life. There is also a interesting museum of modern art (Ludwig Forum) in a former factory building designed in the Bauhaus style. I visited this WHS in September 2011. The octagonal basilica and cupola with the intricate mosaics are the highlight of the "Charlemagne cathedral". A visit to the thermal baths can be a great way to unwind after a day of sightseeing. A couple of details not mentioned in previous reviews. The huge chandelier was given to the church by Barbarossa who apparently was a fan of Charlemagne. And there is a large painting in the church's treasury depicting, among others, King Wenceslas, another significant figure. I've been to this cathedral so many times and yet i'm still fascinated by it. This cathedral is small compared to the duomo of milan and kolner dom.My friend told me the folk story about this cathedral, it is said that the architect made a deal with the devil and the devil wanted the first soul who entered the cathedral, but the aachener were smart, they let a goat walk inside the church and the devil only got a soul of a goat instead of human. The devil went mad and he banged the door but his thumb got stuck on one of the knob.If you touch the inside of the lion's shaped knob in the main entrance you could feel a cold iron inside it. They said it was the devil's thumb. Interesting story no? Aachen is a beautiful small town that is located close to belgium and Maastricht.You can go to Maastricht through Vaalser and there is a hotel named Kastel Bloemendal that is worth to pay a visit.Don't forget to try the hot chocolate they serve in the small chocolate shop called the chocolate company on the way to elisenbrunen from the church, for me the best time to visit Aachen is always at Christmas time. The cathedral didn't look very impressive from the outside and I wondered why it was a WHS, until I stepped inside. The dome is incredible and the golden detailed painting on the roofs were beautiful. The very high stained glass windows are very nice too. If you are in the neighbourhood it's definitely worth taking a peek at. Of the ten German cathedrals I saw in the last two weeks I would have to rank Aachen as third or perhaps fourth on the list. While not as imposing as Koln or Ulm, or as moving as Speyer or Trier, it was, in its own way, breathtaking. Even with what people have said here I was still surprised to see how small the cathedral actually was. The restoration work on the outside seems to be coming to an end from what I gather, there was only scaffolding on the rear, and the majority of the cathedral seems to be in a reasonably good state. The interior of the cathedral was particularly gloomy but I liked this it added more atmosphere to the surroundings. The octagonal chamber was the highlight for me, an architectural oddity and decorated with fantastic tile work, this stands as one of the finest chapels I have been into. I guess this is what the great Byzantine works feel like (though I have yet to visit any of note myself). 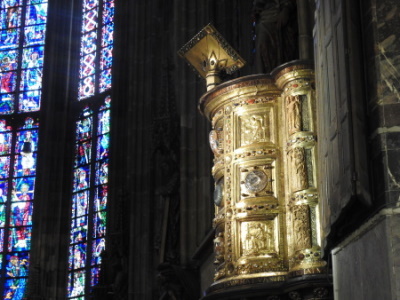 The fine stained glass windows in the gothic addition helped illuminate the large gold coffin of Charlemagne. I really liked the architecture of the cathedral it is a real hodgepodge of styles as it was stared in 794 and seemingly added too consistently for the next 1,200 years, the best place to view this is from the Rathaus square (view in the picture). Unfortunately a massive hangover (damn those Belgian trappists!) and an inability to find the correct door meant I missed the Treasury, and I think this would have really completed the experience. The city of Aachen was quite small and had only a few other things of note, so I think a few hours to see the Cathedral is about enough. It is about 1 hour from Cologne and is very close to the Dutch and Belgian borders so very well connected. Well worth the trip! I would like to go back at some stage when I am in a better, non post-alcohol state! Well, I'm studying in the town of Aachen and so I'm used to see the beautiful cathedral hidden behind large papers as they are rebuilding it. Of course this cathedral can't be compared to the one in Cologne, but it's definately worth a visit, also maybe in combination with the treasure chambery and of course a guided tour through the cathedral (especially if the cathedral is still hidden). You definately shall try the "Aachener Printen", some kind of gingerbread with chocolate. 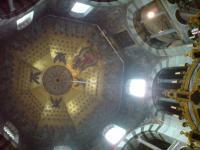 I really liked the Aachen cathedral. Architecturally, it was fascinating. The oldest part, sort of pre-Romanesque, was octagonal, the columns were heavy and there were hardly any windows (thank goodness for electric lighting!). The newer (well, 12th century) part is more what I'd consider high Gothic, with very narrow columns, lots of windows, everything reaching up toward heaven, very light. It's a great combination. Historically, it was the first place I really felt that I understood a little bit about who Charlemagne was and how he thought. But also, how he fit into European history. I was inspired to hit the books to expand my limited knowledge. Definitely worth a visit! This is probably the most important WH site in Germany and the most significant religious building north of the Alps, and it is no wonder that it was the first site in Germany to be inscribed on the WH list. 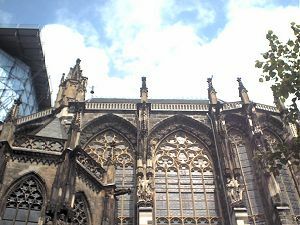 It isn't very big, especially compared to the monster of a cathedral in nearby Cologne, but unlike the Kölner Dom, it does not lack in historic significance. Charlemagne is buried here, in what was his favorite place - because of the thermal springs -, and it was the site of the coronation of German kings for about 600 years. Their simple coronation throne is still visible today and is, besides the famous Octogon, the most interesting part of the cathedral. One of the best sites in Germany, and one of the most important on the continent, for this is where Antiquity ended and Europe as we know it today was born. The cathedral itself is "different" among others on the first sight. It is visible that is a mixture of different architectional styles - Gothical and Romanic (or Byzantine). Later as i read it is because of huge volume of pilgrimes. 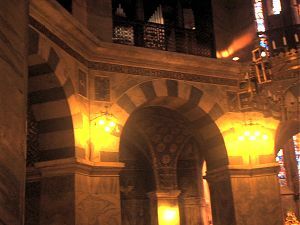 Interior is very interesting - the Byzantine part is build in Octagon shape (8 sides) and has beautiful overhead decoration. Gothic part has nice long windows so you can feel the atmosphere of the history there. Unfortunately i came quite late the guided tour had already started so i was not able to see the Charlemagne's throne and other parts of cathedral. In our trip to Germany we have visited the stunning cathedral of Aachen, probably the most important monument of the country, and the place where for more than five centuries its kings were crowned. It was built under Charlemagne in his capital city about from 790 to 800 as his palatine chapel and the nucleus of today's cathedral. It was constructed as the first church of this type north of the Alps by architects from Metz, called by the king to repeat the structures of the churches that he had seen in Rome and Ravenna (in particular that of Saint Vitale), and consecrated by the Pope Leo III in 805. It had an octagonal ground plan, ringed by an aisle, surmounted by tribunes and roofed by a dome; only part of the original building can still be seen from the exterior on the right side of the cathedral, because a new dome was built in the 18th on the old one. After the fire in 1224 began the construction of the first additions: in 1350 was built the tower on the narthex, in 1414 completed the Gothic choir and then other Gothic chapels, some of which reconstructed in Baroque style (18th century). The main entrance to the cathedral still has the nice original door in bronze with heads of lions, melted at the time of Charlemagne under the direction of Einhard, and gives on the narthex, that keeps a Roman sculpture of a bear of the 2nd century and that of a pinecone of the 10th century. 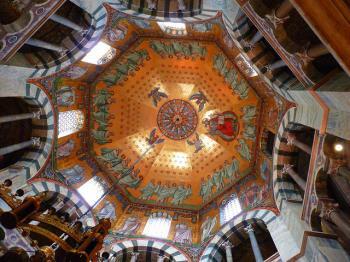 The stunning octagonal Carolingian structure, still well recognizable although the heavy decoration of 1879-81. There are eight arches supported by incredibly massive pillars of two colours, surmounted by a two storeyed tribune with two columns on each side and storey (under triple arches and with gratings of the time of Charlemagne in the first, under only one arch in the second). In the middle of the octagon hangs the huge cooper chandelier (1160-1170), symbol of the heavenly Jerusalem, made under Frederick I Barbarossa. In the tribune there is the Charlemagne's throne, simple but massive, where the kings received the princes' homage after the coronation. The surrounding chapels of the galleries are built on others constructed on the ground floor. There are the chapels of Saint Charles (1465-74), with a nice Gothic portal, where the kings prayed the night before the coronation, of Hungary, built in the 14th century and reconstructed in Baroque style, of Saint Anna (1449, in Gothic style), of Saint Matthias (1400, in Gothic style), where the kings were dressed before the coronation, of Saint Nicholas, Gothic, and of Saint Hubertus (1455-74), from which you can reach the cloister, in part Romanesque and in part Gothic, with columns made of black marble, nice vaults and windows. The stunning Gothic choir of the cathedral, built from 1355 to 1414, similar to that of the Saint Chapel of Paris, has modern stained-glass windows and on the exterior statues of the 19th century. There is the Carolingian altar (800) with the beautiful Golden pall, with 16 relieves, melted on the model of that of Venice, in 1020 in Fulda under the emperor Henry II the Saint. Near it there is a lectern in the form of an eagle, of the 15th century, and the statue of the Aachen Virgin, of the 14th century. Another masterpiece of the Ottonian art is the ambo, donated by Henry IIth for its coronation, made of golden and cooper leaves, divided by filigree, and decorated by gems, six Egyptian relieves made of ivory (6th century), an Egyptian cup and a crystal plate (10th century) and various fragments. The last and biggest masterpiece is the silver casket (near an another one similar), with relieves and sculptures, made in Aachen from 1200 to 1215, to contain the bones of Charlemagne; over it hangs a double statue of the Virgin, one of 1488, the other of 1524. I think that Aachen cathedral is one of the most beautiful places I've ever seen because of its incredibly beautiful architecture and its marvellous masterpieces. It's absolutely worth of a visit as one of the best WHS and fully justifies the inscription. The state of conservation of the buildings is perfect, but the authenticity of the Carolingian part of the church is altered by the many successive Gothic, Baroque and modern additions. In particular the modern ones diminish the authenticity of the Carolingian building and also of the additions: for example the inappropriate stained-glass windows of the choir, the modern mosaics and statues, even if they are imitations of high quality of historical styles. I was very disappointed by the fact that all the chapels are normally closed and you can see the Charlemagne's casket only from about 50 metres of distance because you can't walk in the choir. Also the cloister and the museum of the Treasure was closed, so we weren't also able to see the Charlemagne's throne, accessible only from the museum. Apart from the WHS, the most important monument of Aachen is the huge Gothic town hall. You can easily reach the town from an exit on the highway A4 going from Cologne to the boundary with the Netherlands; you have to park outside the town center. The mosaics on the ceiling had me spellbound. I could have spent hours in this church transported me Charlemagne's time. As a graduation gift from my parents I was sent to the south of Holland to visit with my mother's family. My second eldest aunt, and her sister-in-law took me on a day trip to Aachen and we visited the Cathedral there. The exterior is in the midst of restoration, and hence covered with hscaffolding, but the interior of the octagon took my breath away. I had studdied Roman culture and archetecture in high school and was amazed at the quality and magnificent state of preservation of the mosaics that cover the interior ceilings of the Dom. aside from considering it a beautiful site, I didn't really appreciate the historical significance of the site until I began my university education, and in courses in both art and history, learned about the great significance of the aachen dom to the cultural history of Europe. Charlemagne: He was buried in the Cathedral (814). He also began the construction of its Palatine Chapel around 796. Cathedrals: Church of St Mary/"Kaiserdom"
Marian Shrines: Shrine of St Mary in the Cathedral - "Sanctuary built by Charlemagne. A chapel in the main cathedral of Aachen houses four major relics believed to be from biblical times. They were never exhibited before the fourteenth century and since then only infrequently. They are the swaddling clothes of the Infant Jesus; the cloak of Our Lady; the loin cloth of Christ on the Cross; and the cloth on which lay the head of John the Baptist after his beheading. The separate reliquaries containing them are in themselves works of art. Great pilgrimages flock to Aachen to venerate these treasures in July of every seventh year, when they are on exhibition. 311 Community Members have visited.